The antibody sequence information is essential for monoclonal antibodies (mAbs) engineering, function optimization, database banking, and patent application. Our ISO9001 certified antibody sequencing service is your reliable choice to speed up and facilitate therapeutic antibody leads discovery and development. Tailored to meet your particular requirements, option with customized specifications is offered for antibody sequencing services at GenScript. Short turn-around time: 6 days for full length antibody sequencing- Our record! GenScript will sequence 5 independent clones for each chain, to ensure accuracy. GenScript can also express the whole IgGs in a mammalian expression system and further confirm the antigen-antibody binding performance to double-ensure accuracy. Mutations introduced by PCR: During the amplification of the cDNA, the use of degenerate primer sets means there is the chance of mutagenesis. GenScript always uses both 5'- and 3'- RACE (rapid amplification of cDNA ends) to ensure accuracy of amplified products. GenScript always performs full length sequencing of the variable region, which ensures the accuracy of the sequence span, from leader sequence to the start of FR1 region. GenScript has sequenced over 6,000 mAbs, our expertise ensures the sequence you receive is 100% accurate. @Applicable to human IgG1, human IgG4 and mouse IgG2. For sequencing services: Client will need to submit hybridoma cell samples (>1×106 cells) to GenScript. For antigen-antibody binding confirmation service: Client will need to submit 20 μg antigen (>85% purity, >0.4mg/ml) in the buffer without SDS, CHAPS, TWEEN, TRITON and PMSF. 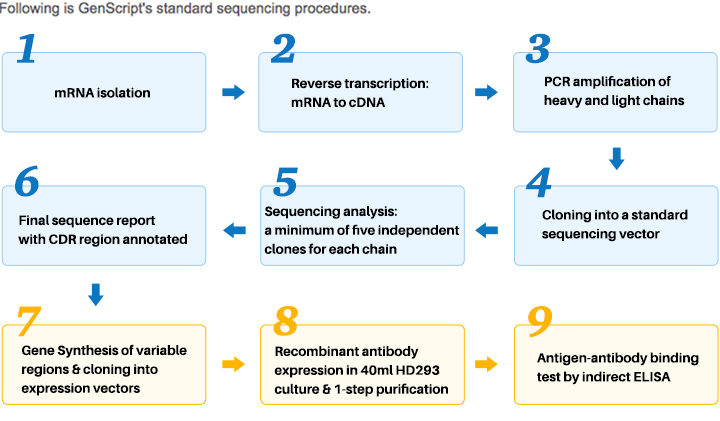 For sequencing services: Final sequence report with leader sequences and CDR region annotated/ Final sequence report with leader sequences, constant region and CDR region annotated. Sequence data, alignments of the heavy & light chains (free), sequencing plasmids containing sequenced antibody coding sequence (additional $100) expression construct containing full-length antibody coding sequence (additional $350) is available upon your option. For antigen-antibody binding confirmation service: GenScript delivers 1mg recombinant antibody synthesized from hybridoma sequence, QC, expression level and ELISA binding test report. The client retains all rights to the sequence data and all related intellectual property. GenScript offers our customers a one-stop solution for all outsourcing needs, providing comprehensive upstream and downstream services of monoclonal antibody sequencing service. Why do you need Antibody Sequencing? Avoid problems like gene loss & gene mutations, etc. Why do you need Recombinant Antibody Expression? Please contact us mentioning "Discovery Biology", our customer service representatives are available 24 hours a day, Monday through Friday to assist you with Quotation Form preparation.